Why associations combining forces provides a boost to the industry’s supply chain. SEMI’s mantra is: Connect, Collaborate, Innovate. This mantra has delivered industry-enabling value to our members since SEMI’s beginnings in 1970. It has been essential for SEMI members to grow and prosper locally, while being synchronized globally. As the electronics manufacturing business has become more complex and interdependent, SEMI’s mantra has increasingly been applied across the full span of electronics manufacturing. 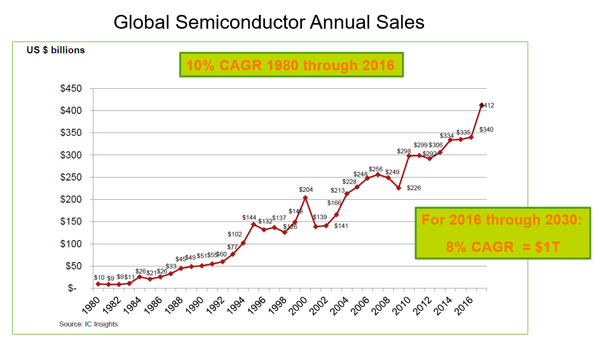 With the IC industry now worth over $400 billion in annual revenue, developing a single new chip can cost hundreds of millions of dollars. Consequently, industry players now connect, collaborate, and innovate in new, but more often, deeper ways. This is especially true with IC design – what’s possible in chip design is only possible if the manufacturing processes can be developed as projected. It makes sense, as complexity grows and the stakes get higher, that design and manufacturing are closely linked and apply the SEMI mantra together. “Where Electronics Begin” is the tagline of the Electronics System Design Alliance, or the ESD Alliance. It aptly distills the fact that all IC manufacturing begins with design – and the design ecosystem. This week, SEMI announced it reached an agreement with the ESD Alliance to join SEMI as a SEMI Strategic Association Partner. The ESD Alliance will become part of the SEMI organization in 2018. With the ESD Alliance and its community joining SEMI, its membership will complete the full electronics design and manufacturing span. This is a momentous step forward. The ESD Alliance’s ecosystem is vital and thriving and includes the world’s leading EDA and IP companies. Within the ESD Alliance community, Aart de Geus (Synopsys), Wally Rhines (Mentor, a Siemens Company), Simon Segars (Arm), and Lip-Bu Tan (Cadence), among others, are already familiar figures, having brought their thought leadership to SEMI platforms in the past. Now they, and the rest of the ESD Alliance members, will be able to more directly work with semiconductor equipment manufacturers, devices makers, and the rest of SEMI’s membership. At events like SEMICON China, which recently concluded in March and attracted over 90,000 attendees, SEMI and the ESD Alliance members will be able to efficiently connect and engage the supply chain players and find new areas for collaboration. As SEMI’s membership looks out towards new applications and systems opportunities, having both ecosystems together will find possibilities faster and innovate approaches more practically. The ESD Alliance will maintain its distinct community identity and governance while having access to, and the ability to augment, SEMI’s global platforms including seven regional offices, programs and expositions (including SEMICONs), advocacy (including trade, tax, talent, and technology), industry research and statistics, and other SEMI Strategic Association Partner and technology communities. 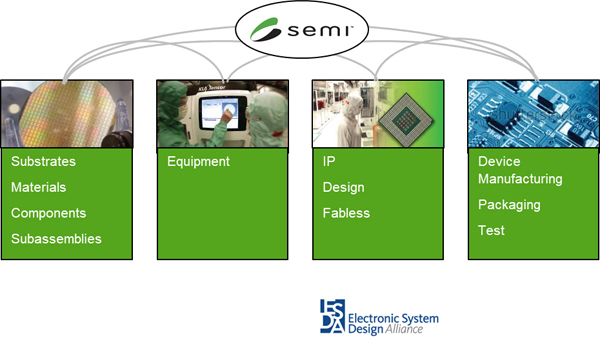 SEMI will gain direct access to the electronics design ecosystems to provide a deeper and wider value – to its combined membership – with SEMI’s mantra. SEMI and its more than 2,000 corporate members and more than 1.2 million stakeholders look forward to connecting, collaborating, and innovating with the ESD Alliance and its members. SEMI’s global reach and wide span of membership with ESD Alliance’s deep expertise in design and IP is truly the best of both worlds for all stakeholders. SEMI’s members have been reaching into the electronics design ecosystem and the ESD Alliance members have been reaching into SEMI’s ecosystem to optimize design and manufacturing process for lowest cost and highest yield. This week’s announcement is a step forward to directly and more intimately connect electronics design and manufacturing for the supply chain to work more closely together in full synchronization. With the ESD Alliance joining SEMI as a Strategic Association Partner, SEMI members can better collaborate across the full supply chain. Gone are the days when it was enough to collaborate only with one’s direct customer. Today, for example, components and c-subs suppliers frequently collaborate not just with their OEM equipment manufacturer customers, but with device manufacturers – and even system integrators. To be successful, companies are striving for connection to their customers’ customers. The ESD Alliance, with its design ecosystem and linkage to the fabless community, will join three existing SEMI Strategic Association Partners: Fab Owners Alliance (FOA), MEMS & Sensors Industry Group (MSIG), and FlexTech (the association representing the flexible hybrid electronics ecosystem). These relationships now cover the entire span of electronics manufacturing. To provide focused collaboration across the full supply chain, SEMI has developed five vertical application platforms: IoT, Smart Manufacturing, Smart Transportation, Smart MedTech, and Smart Data. These have been chosen because of unique and pressing needs to synchronize the supply chain and to engage and develop solutions collectively. With the confluence of emerging digital disruptions and new demand drivers, forecasts suggest the IC industry could grow to over $1 trillion in annual revenue by 2030. To deliver this growth, the supply chain must efficiently innovate together. SEMI’s value proposition is to speed the time to better business results for its members across the global electronics (design and) manufacturing supply chain. The addition of the ESD Alliance as a Strategic Association Partner is a key contributor to deliver this value proposition for the industry to grow and prosper now and in the future. Ajit Manocha is president and CEO of SEMI. He currently is executive chairman of POET Technologies, and is the former CEO of GlobalFoundries.